The species is widespread in southern and eastern England, with scattered records in the south-west, Wales and the north. It is widespread in western and central Europe. The only member of the genus usually to be regularly found on bushes or young trees in woodland, especially favouring young oaks. Adults of both sexes are found mainly between April and June, occasionally later. 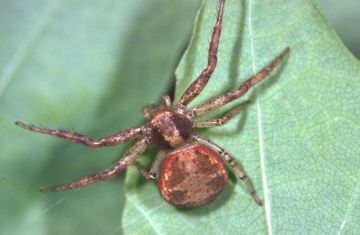 Despite some reports in literature that this is a common spider, this species is generally scarce, but may be fairly common in woodlands in parts of the south. In some southern counties such as Essex, it is definitely rare. There is some evidence of decline in the last 30 years. Loss of broadleaf woodland to agriculture and forestry development may have played a role in the decline of this species in the past but these threats are less prevalent today. Protect deciduous woodland from conversion to conifer plantations or arable.